​​​​ TEXAS GULF COAST – Total global trade for Texas ports is estimated to be valued at more than $503 billion annually. The Port of Houston ranks as the top breakbulk cargo port in the U.S., and the other Texas ports of Corpus Christi, Brownsville, Houston, Galveston, Freeport, Beaumont, and Port Arthur are also important to this highly specialized segment. 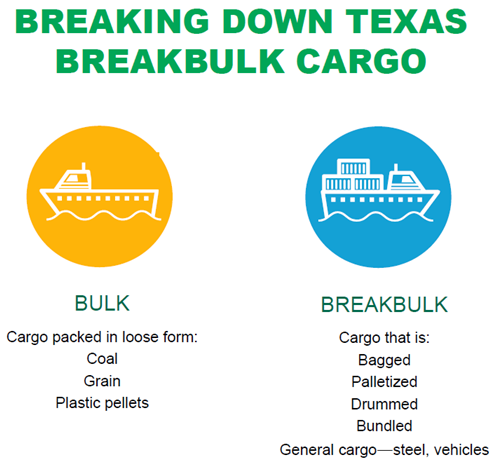 Major breakbulk commodities for these Texas Gulf Coast ports include steel, forest products (wood pulp in particular), wind energy production components, and the many feedstocks and products related to the energy industry. Unlike other land-constrained U.S. port markets, Texas ports have a significant contingent of land available for development—totaling 76,000 acres. CBRE makes better sense of this full report here.